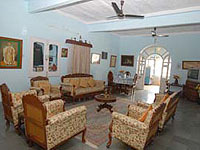 Shri Ram Guest House provides cosy environment to its guests. Owned by a scion of the Rao Bika (founder of Bikaner) family the Guest House is an embodiment of Rajput culture and tradition. The owner, a retired Brigadier, enjoys enlightening the visitors on a variety of subjects ranging from the history, culture and religion of Rajasthan on request. His interests are homeopathy, yoga, spiritual healing and shooting. "Home away from home" is the motto of the Shri Ram Guest House. It is tastefully decorated are spacious rooms, with attached baths having hot and cold running water. It is located in a calm, quiet residential area within 1.5 Km city center. Open Courtyard in front and rear with big open terrace upstairs make the stay memorable and nostalgic. Col. Rajyawardhan Singh Rathore brought accolades to our family by winning silver medal in shooting athens Olympic 2004 representing India. He is very charming and fond of his lineage. He often comes and visit this heritage Guest House. Games; He also won gold in the individual and team events in Men's double trap at the 2005 Asian Clay Shooting championships at Bangkok; double trap team gold in 2005 Commonwealth Shooting Championships; Awareded Rajiv Gandhi Khel Ratna Award in 2004; Ati Vishisht Seva Medal. Shri Ram Guest House Commitment to Natural Resources and conservation – Conceived out of deep commitment to ecology and healthy living, shri ram embodies our attitude towards life. We opened this eco-lodge to travelers in 1993, offering charming accommodation in an authentic surrounding. Lying in the north of the desert state, the city is dotted with scores of sand dunes. Bikaner retains the medieval grandeur that permeates the city's lifestyle. More readily called the camel country, the city is distinguished for the best riding camels in the world and hence boasts of having one of the largest Camel research and breeading farm in the world. The ship of the desert is an inseparable part of life here. A camel besides doing transportation duties, also works on wells. These are built on high plinths with slender minarets on each of the four corners and can be noticed even from a distance. Through traditional Indian way of bathing (bucket and mug), the villagers use mere 15 liters of water per person per bath. In all cases, the water in the bucket remains clean and if any is left, it can be used for other purposes. Taking shower with running water requires 2 to 3 times more. Therefore, buckets and mugs are available in each bathroom as well as running hot and cold water but through taps only.